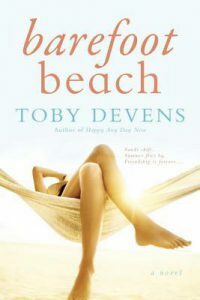 Barefoot Beach takes place in a small beach town on the Atlantic coast of Maryland. The beach and the ocean, together with the town itself, with its homey little businesses like dance studios and ice-cream shops, are the real centers of the story. The beautifully written descriptions of the ocean and the sky with their ever-changing colors and currents, the tactile descriptions of the feel of the wind and the sand and the shells and sea life underfoot on any given day, and the obvious appreciation of even the grey and cloudy days as just part of a multifaceted but benevolent nature, all make it credible that Nora would treasure this place even as it reminds her constantly of her beloved but deceased husband. But Nora is lonely and, to make things worse, she is a born worrier. She worries about her son’s attraction to his new girlfriend – whom she has never met – and is terrified that her son, who was conceived by artificial insemination, will hook up with his biological father. She worries about her friend’s teenage daughter who is rebelling against her ultra-strict father. She worries that another friend’s longtime husband might be having an affair. Granted, these are all potentially worrisome things, but most of them could probably be put into the category of “mind your own business.” I found myself wishing she would. She does have a real financial problem actually facing her, but, amazingly enough, she doesn’t worry about that. She just takes action to solve the problem. I got that. And, although he might in some passages seem like a dumb animal who can be manipulated by cookies and cleavage, her son at other times sounds more like an anxious middle-aged woman himself. “Do you know what time it is?” he asks her when she arrives home one night. “Past midnight … I’ve been crazy worried about you.” A nineteen-year-old guy says this? Really? Some of the other men don’t sound like any men I know. For example, a middle-aged husband of her friend confides in her. “I could use a little spousal-caring credit [from his wife]?” Really? Men say that? The basic concept of the book seems to be that relationships trump everything else. When one of Nora’s dance students keels over with a heart attack, his wife cries out, “Marty! Fifty-two years together. Don’t leave me!” Touching? Maybe. But I couldn’t help feeling that the “Marty” part was not really as important to the woman as the “fifty-two years” part. In other words, really, deep down, the long marriage was more important than the particular man in it. But this is not supposed to be a story written for men, or about them either. It’s the story about enduring female friendships. When the handsome, kind, wounded-but-very-vigorous (and newly divorced) war hero comes to town, no one will be surprised at what happens next. But that’s okay. This story isn’t about him or any of the other men in town. It’s about a woman surrounded by beauty and engulfed in a warm sea of friendship and kindness so calm and satisfying she doesn’t even really need (but kind of yearns for) the sexual lifeboat relentlessly motoring her way.